Blue Buffalo Basics Limited Ingredients Dog BiscuitsOur Blue Buffalo Basics Limited Ingredients Dog Biscuits are a favorite of health-concerned pet parents because they deliver the great taste and satisfying crunch that dogs crave without any of the corn, wheat or soy which may cause unpleasant allergic reactions. And because they are from Blue Buffalo, Basics are as nutritious as they are tasty. Made with wholesome grains and healthy ingredients like carrots, Blue Buffalo Basics Dog Biscuits are oven-baked for old-fashioned goodness. They even look homemade. 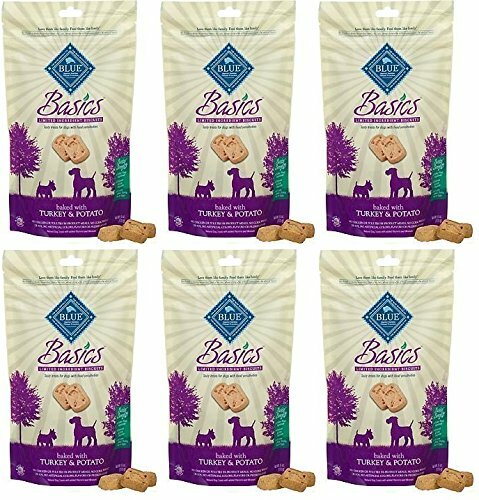 In addition to providing the superior nutrition of the finest natural ingredients, Basics have limited ingredients making them perfect for dogs with food sensitivities! Blue Buffalo Basics contain some of nature's most healthy and highly digestible ingredients including oatmeal, brown rice, flaxseed and potato. So while your furry family member is crunching away happily -- and keeping his teeth cleaner at the same time -- you'll know that the biscuits he loves are really good for him. If you have any questions about this product by Blue Buffalo, contact us by completing and submitting the form below. If you are looking for a specif part number, please include it with your message.